Health insurance is insurance against the risk of incurring personal medical expenses. Two types of health insurance have developed in modern society: private health insurance and publicly funded health insurance. A premium is the amount a policy-holder or his sponsor must pay to a health plan in order to purchase health coverage. A deductible is the amount that the insured must pay out-of-pocket before the health insurer pays its share. Co-payment is the amount that an insured person must pay out of pocket before a health insurer pays for a particular visit or service. An explanation of benefits is a document that may be sent by an insurer to a patient. This document explains what was covered for a medical service, and how payment amounts and patient responsibility amounts were determined. The premium is the amount the policy-holder or his sponsor pays to the health plan to purchase health coverage. The deductible is the amount that the insured must pay out-of-pocket before the health insurer pays its share. Co-payment is the amount that the insured person must pay out of pocket before the health insurer pays for a particular visit or service. Explanation of benefits is a document that may be sent by an insurer to a patient explaining what was covered for a medical service, and how payment amount and patient responsibility amount were determined. The medical model of medicine science focuses on the eradication of illness through diagnosis and effective treatment. The social model of medicine science focuses on changes that can be made in society and in people’s own lifestyles to make the population healthier. deductible: A deductible is the amount that the insured must pay out-of-pocket before the health insurer pays its share. premium: The premium is the amount a policy-holder or his sponsor must pay to a health plan to purchase health coverage. co-payment: A co-payment is the amount that the insured person must pay out of pocket before the health insurer pays for a particular visit or service. Health insurance is insurance against the risk of incurring personal medical expenses. By estimating the overall risk of health care that a target group will require, an insurer can develop a routine finance structure, such as a monthly premium or payroll tax, to ensure that money is available to pay for the health care benefits specified in an insurance agreement. These benefits are administered by a central organization, like a government agency, private business, or non-profit organization. Two types of health insurance exist in modern society, private health insurance and publicly funded health insurance. Private insurance, based on free market principles, refers to health insurance provided by a non-governmental organization, usually a privately owned or publicly traded corporation. Among developed nations, the United States is the only country in which private insurance is the primary source of healthcare. In contrast to this private method, in public insurance, health care is paid wholly or mostly by public funds. This type of health care is the most common and popular in almost every developed and developing nation in the world, except the United States. The majority of developed nations have publicly funded health systems that cover a majority of the population. Some of the essential terms associated with health insurance are premiums, deductibles, co-payments, and explanations of benefits. A premium is the amount a policy-holder or his sponsor (e.g. an employer) must pay to a health plan to purchase health coverage. A deductible is the amount that an insured individual must pay out-of-pocket before the health insurer pays its share. For example, policyholders might have to pay a $500 deductible per year, before the health insurer covers any health care costs. A co-payment is the amount that an insured person must pay out of pocket before the health insurer pays for a particular visit or service. For example, an insured person might pay a $45 co-payment for a doctor’s visit, or to obtain a prescription. A co-payment must be made each time a particular service is obtained. Lastly, an explanation of benefits is a document that may be sent by an insurer to a patient. This document explains what the insurer will cover, in terms of medical services. It also explains how payment amounts and patient responsibility amounts have been determined. Healthcare improves as a result of advancements in medical science. Modern medicine approaches health care from two angles. The first, the medical model, focuses on the eradication of illness through diagnosis and effective treatment. The second, the social model, focuses on changes that can be made in society and in people’s lifestyles to make the population healthier. This second method typically focuses on preventative care. Modern, scientific medicine has proven uniquely effective at treating and preventing disease. It is increasingly widespread and more widely accepted than other forms of medicine. Modern medicine is notably secular, and indifferent to ideas of the supernatural or the spiritual. Instead, it concentrates on the body and society to determine the causes and cures of health issues. Modern, scientific medicine is the most effective contributor to the health of humans in the world today. 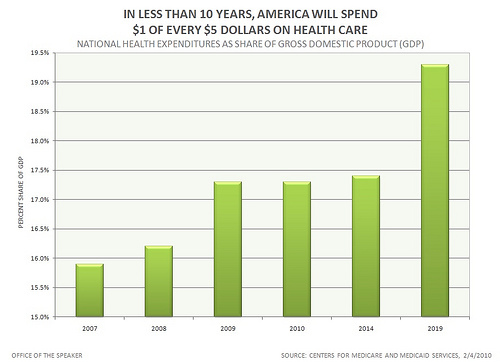 In less than 10 Years, AMERICA will Spend $1 of Every $5 Dollars on Health care: Across the country, American workers, their families, and small businesses are struggling with rising health care costs and policies that put quality, affordable care out of reach. A new report by the Centers for Medicare and Medicaid Services (CMS), published in the magazine Health Affairs, estimates that spending on health care grew to 17.3 percent of the U.S. economy – a record and the largest one-year jump since 1960.